I must admit I didn't get as much homework done as I had hoped. I figure it is all good because I had a fabulous weekend. Here is a little recap for you. Friday night: indoor soccer game, battle of bands. Saturday: lunch with friend, house party with multiple keggers, air guitar competition (sadly couldn't stay for this...had to leave early), and live music, TWO more indoor soccer games, Indian and cowboy party. Sunday: last day of work at Brown House in Corvallis, BBQ with indoor soccer team, and then I did homework. 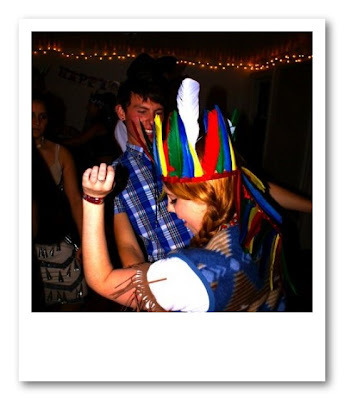 Just dancing as an Indian with my friend Austin.